It’s been a long time since my last outfit post, yes? It’s about time I post one again now that my blog’s facelift is finally done. Yay! If you remember my post before, I mentioned that I had a shoot at the newly opened Mind Museum for a prestigious magazine. The magazine is finally out! It’s for MEGA Magazine’s 20 Most Stylish Women of 2012. I was also part of their list last year (10 Most Stylish) so I was really surprised and honored to be part of it again. Thank you MEGA! I’ve already seen the list and I must say, I’m in really good company. Most, if not all, of the women on the list are those that I look up to so it’s a HUGE compliment to see my name beside theirs! I’d probably get intimidated when I see them all later at the Most Stylish party. Ack! So anyway, for the said issue, here’s one of the outfits that I wore. I chose to wear something sophisticated and simple but still striking in my own little way. The photos below are not the ones shot by MEGA. I’ll probably post them in a separate entry when I get my hands on a copy! I haven’t seen the actual editorial yet but I’m sure it looks so cool because we shot inside the Mind Museum. Plus, our photographer, Joanne Bitangcol, is awesome! If you haven’t gotten yourself a copy, go grab one now! There you have it! For me, my outfit here is the perfect example of mixing high, medium and low-cost items. Fashion is so much fun when you mix and match. If it’s really beautiful, it’s beautiful no matter what the price is! Agree? camille ur amazing! l love the way you put up dresses even a piece of strand will be magically be a fantastic when your the one who wears it! The pronunciation of YSL is really bizarre. haha! I was surprised that it was pronounced that way. I wonder if they teach you how to pronounce their brands with every purchase. haha! cute skirt! kinda corporate outfit. haha. well, it`s just my opinion. but it`s very classy. I like your shoes sweetie! I am not updated with your blog anymore! I need to catch up! Hehe. I love your outfit! <3 Do you feel comfortable wearing that kind of shoes? I am just curious. Hehe. Tsk tsk! I’m judging you! Haha I kid :) These YSL shoes are comfortable, just not for dancing the night away. hi camille. i love your necklace. where can i buy Extreme Finds ? thanks. Love your make up here î• did you do it yourself? Your’e so pretty. I like your outfit. Thanks! The credits are there :) They’re from YSL. This voluminous hairstyle suits you. Vavavoom! Thank you Patsy! I wish I can do this myself! Such a pretty look! It’s so chic and corporate, but more importantly, very Camille Co! Congrats in being in Mega! How come you so pretty and gorgeous and fashionable? You got natural curls right? They’re awesome. It’ so much better I’m telling you! :) Move already! wow! itso rare for popular bloggers like you to respond to all the readers’ comments! only shows u remain humble despite all the fame! :) mag artista knlng te! haha. i kid. such a big fan of yours! sana matuloy ka na sa cagayan so that i could finally meet you! isa lang nmn gusto ko eh, picture with u! hehe. Congratulations for being part of MEGA Magazine’s Stylist women! Aww, its so nice to see your new blog and your new posts! Awww thank you! Cute brother you have there! Hi! Just dropping by to tell you that your blog is one of my daily-reads. And since then I became bolder on my take on fashion. I love it that many of your outfit posts I can wear in my office which is stereotyped ultra conservative. Lavet! Anyhow, I like the new look of the website, but I must say that I do miss seeing your picture that was then posted on the left marginal portion of your old site (the one published in one of your features in a mag). Just the same, a big congratulations to you: for the new site, the recent mag feature and the first anniversary of your blog! So happy for you! Thanks so much Charity! The photo you’re pertaining to is still there! :) Click the “About Me” on my navigation bar to see it. I’m happy you find my blog inspiring! Thanks again! hello, very nice outfit, especially the shoes! ;) i like your style ‘chic’, simple but elegant “bongga!”. Where did you usually shop at Hong Kong?? Love this look, and in general, your blog! You’ve found a new follower here! I love your new blog and I’m glad that you moved to a new platform! :) congrats for being one of MEGA’s most stylish – you deserve it! Thanks Therese! So happy too! i love it! the skirt caught my attention:) wow! loving your blog Camille :) keep it up! Thanks Candy! I’m 5’7″ :) I’m scared to wear heels too but i try my best to brave it haha! i really like your style! :) but can i ask where you get your BANGS done? or how it was cut?ehe. :) stunning! Heart your skirt. Great shoes! Lovely belt too. Congrats on making the 10 and 20 most stylish, you deserve it. ps: congrats for being most stylish women for 2012! I really love your new blog, Camille! Congrats on the success of pimping your blog, and congrats on being one of MEGA’s Most Stylish. I’m so proud of you. You totally deserve the title. Thanks Marcel! I’m so happy! The 2ND Photo truly blow me away! GORGEOUSNESS!!! Just like everyone says, you really deserved to be the most stylish ppl!! Pretty rings and that belt match perfectly with the skirt, gorgeous! and congrats with the new website!! super love it! Love this outfit! It’s so classy! I’m really happy that you have an outfit post again. You look so gorgeous! Congratulations for being one of the Most Stylish Women for 2012. You really deserve it! Btw, may I ask you something? What would be the best look for an interview? What would the hair should look like and also the outfit? I hope that you’ll give time answering this. Thanks Darleen! For job interviews, wear a collared blouse, closed shoes (preferably with heels) and slacks/long skirts. Make sure you look neat and simple. Keep you hair up to achieve this. Good luck! Omg I love your belt! I dint see that in zara! :( where else can I get one? I’ve beeenn looking for one since last year! Absolutely love the shoes! Love the colour! You really look awesome here, from head to toe! Love it! Thank you! I don’t know what it’s called though because i just let my hairstylist do whatever. I go to Park Jun Salon if it helps. wow!! chic at its finest!! and i love the new look of your blog!! 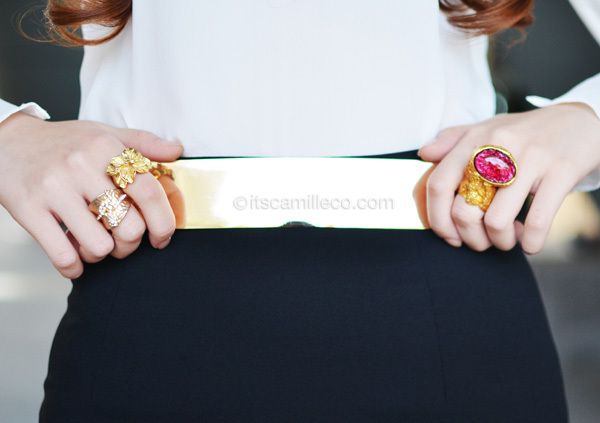 I really, really, really love your new blog Miss Camille! I really, really, really love your mini/long skirt! I really, really, really love your outfit! Thank you so so so much! :) Haha! Love the outfit!!! Stylish and really classy!!! You’re definitely one of my fashion icons. GEEZ your hair looks amazing. Is it the same color as before? Looks a little darker? Same color. :) Thank you! Thank you :) I really have so much more to achieve! your new web site is awesome! way better than the old one. what a sophisticated outfit. lovely. I was wowed! very simple yet elegant. :) Did you out on the make-up by yourself? :) that’s pro right there. :) thank you Ms. Camille for living your life to inspire others.â™¥â™¥ Blessings more! love it :)always so chic and classy :D love the blog’s new look too! Hi Camille! Who designed your site? It’s really nice. :) I also like your outfit here. You achieved the simple yet elegant look. My awesome friend, Karla Lim :) Thank you Cat! A long backed skirt… Kinda reminds me of the cape in your previous post. And that’s one shiny belt buckle. Love how the red pumps accent the entire outfit by being the only brightly colored one. Hey. I’ve been loving how classy each and every outfit you’ve been posting. Though it’s quite out of the question, I’d like to ask what kind of Camera do you use? If you don’t mind me asking. Thanks AC! :) I’m humbled! Thank you so much Gilbert! To your sisters too!